Ah, the condo again. Seems like all I blog about anymore! I am probably the only one who cares, but what the heck :) Well, my mom and I went and worked on it again today, and managed to completely finish my room, and most of the closet. My boyfriend and I put together the last of the shelves, and hung my painting I bought for the living room. It looks awesome! I can't wait to get my couch in there to pull it all together. I posted my inspiration picture for the living room before, so I decided to do a post about all my inspirations for each room in the house. This is what my poor dining room looked like when everything was first moved in. Since then, I bought some cute candles, vases, and place mats but it's nowhere near finished. I'd like to do a black and white wallpaper on one wall in the dining room, and black chair covers. My accent colors in here will be purple and green. These are the place mats I got at Target for $1 apiece! I also got one purple and one green Woodwick candle to match. This is a picture I snapped in a magazine that I just fell in love with. I adore the bright colors and the unexpected pop of orange. 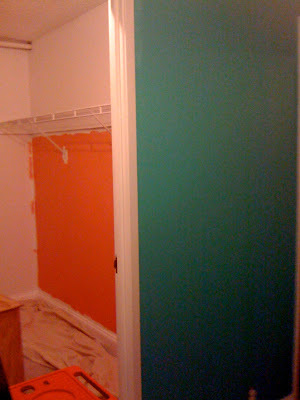 So I made my bedroom turquoise (there's a picture of it in the last blog) and painted my closet orange. It's not finished, obviously, but it has the same effect (I hope!). 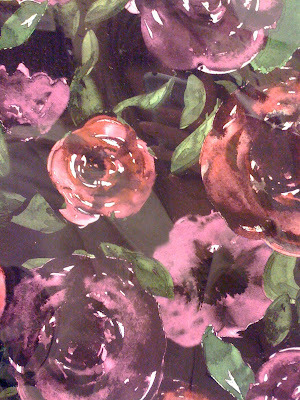 This is the color scheme I want for my bedroom. 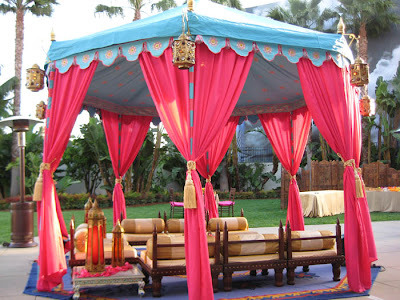 Is this not the most fabulous tent ever?! I want my wedding to look like that, by the way. But for now I'll settle for my room. I wish I could find my actual inspiration picture for my bathroom, but this will have to do. This one is waaaaaaaaaay better and more complicated than I could do! 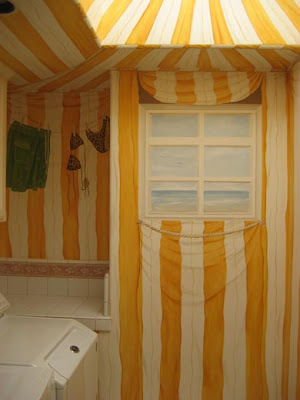 In the Domino decorating book, there is a small bathroom painted with a trompe l'oeil effect so it looks like a circus tent. It's much simpler, just straight lines, and black & white. It's the coolest bathroom idea I've ever seen! I hope I can pull it off. For my hallway, I'd like to paint it black and leave the trim white. It looks so elegant. I love this picture, but I'm sure my hall won't be nearly as fancy :) I wish! My boyfriend takes manual pictures and develops them in a dark room, so a black hall will showcase his work beautifully. Looks like it needs some love, doesn't it? The crowning jewel. My closet room/dressing room. This picture of Miley Cyrus' closet is so perfect, I can't even begin to describe. It's my dream closet! I don't like her that much, sadly. She has nice taste in closets, though! 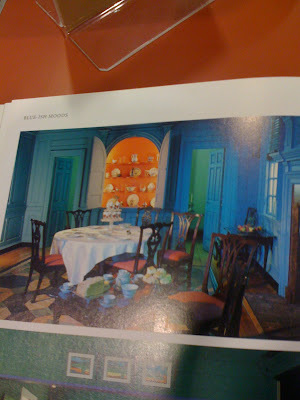 I am going to paint mine that same shade of pink, and maybe even put up chandelier decals. I am also looking for a good ottoman and a large mirror to put in there. It just looks so plain with all the grey! Also, good heavens I have a lot of clothes. Maybe too many. Naaaaaah. Any ideas or suggestions, friends? I'm open to them all! Nice blog! Love you Jess you are so beautiful!